Some students want to write more than what is required of them in writing workshop. 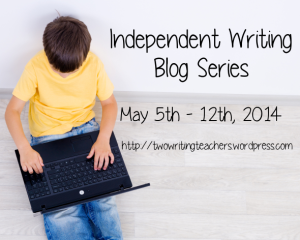 Enter independent writing projects! But how do you go from being another set of eyes on some additional writing a student does to helping a young writer student go public with their work? Thank you so much for all of your reflections and hints and suggestions and links in this week’s blog series. Every post has been full of useful nuggets. There aren’t too many things that get me excited at 8:30 on a school night when I’m usually in bed reading my book, but I’m really excited about tomorrow night’s Twitter chat. That’s wonderful, Lisa – “see” you tomorrow night! I’m delighted you’re going to join us, Lisa! We’re looking forward to having you as part of tomorrow night’s chat.